I got back two days ago from a much needed Christmas vacation in Colorado. It was a wonderful, wonderful break and I felt better than I have in months being home. This year was a tough one but one thought kept tugging at me, just an idea of what I needed. This summer I went to a free Judy Collins concert on Governor's Island. It was part of some annual folk music thing that Trinity Church sponsors. Now normally I would not identify myself as a folk music fan, but I had recognized some of her songs after googling and thought "What the hell. It's free and I have never been to Governor's Island." I also kind of love ferries, so there was that. Before the concert even started I was glad that I went. The crowd was happy and pretty hippy, which is to be expected. I recognized most of the music but it was this song I had not heard before that struck me: Mountain Girl. I was homesick a lot this year and the lyrics fit me perfectly. Find your way back to the mountains"
My "home-home" is in the foothills. I am used to having deer in the backyard because they have stopped by at least once a day my whole life. My mom is a gardener and has a compost pile in the backyard. Unfortunately it rarely every grows in size because the deer, bear, or foxes gorge themselves on whatever we add to the pile. The deer are pretty used to humans to the point that they stop and stare from a couple yards back, or walk slowly in front of the car, but they rarely come right up to humans. Well, this year I went out one day when there was a large herd in the backyard and said hi, meaning I slowly approached them to see how close I could get. Well this time they seemed particularly interested in me so they didn't run. One deer in particular seemed really comfortable with my presence. She licked my hand that day when I reached out. 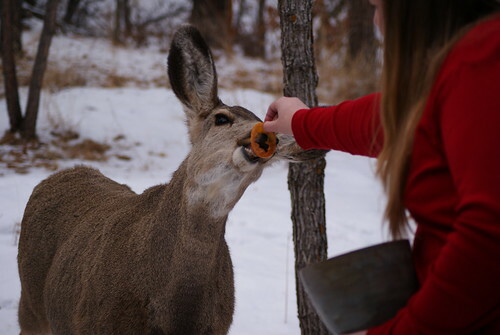 Two days later on Christmas Day I was bringing out the orange slices that had been soaking in our non alcoholic Glögg, to the compost pile and the herd of deer was out there. The one that licked me the first day came right up and ate the oranges out of my hand. I named her Clementine. The buck saw this and decided he wanted in on the action, but since bucks can be very aggressive my mom (the photographer) made me go inside. 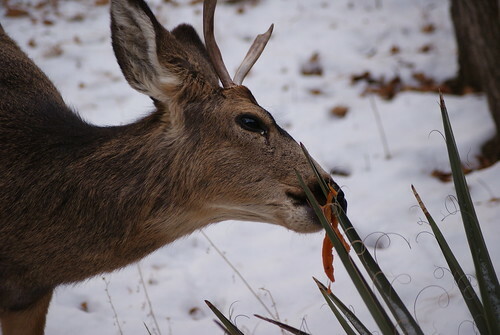 I hung some oranges on the Yucca plant for him. He was grateful. 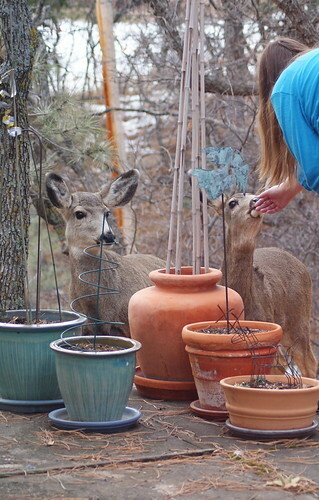 Once the buck went to inspect the neighbors yard I was allowed back out where Clementine was standing with a friend. 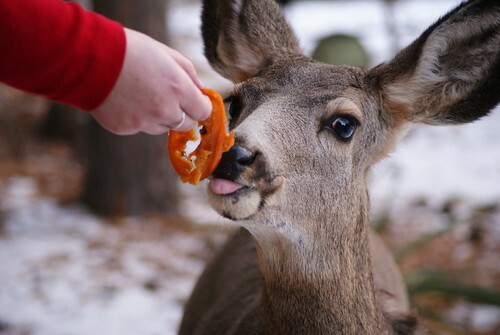 The friend was slightly more skittish than Clementine but slowly warmed up enough to eat a few oranges as well. So there you have it. I spent my Christmas with my family and the neighborhood deer, and that is where I am going to leave my blog for 2009. Happy New Year Friends! Here's hoping 2010 is a great one! *PSA- Don't go near deer. They are wild animals and I am very bad example. You never know when an animal is diseased or will become aggressive. People are hurt from deer every year. Wild Deer are NOT Bambi!!!!!! !